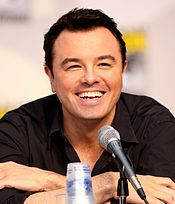 Seth MacFarlane, creator of The Life of Larry and Larry & Steve. The Life of Larry and Larry & Steve are two animated short films created by Seth MacFarlane in the mid-1990s that eventually led to the development of the animated sitcom Family Guy. MacFarlane originally created The Life of Larry as a thesis film in 1995, while studying at the Rhode Island School of Design. His professor at RISD submitted MacFarlane's cartoon to Hanna-Barbera, where he was hired a year later. Later that year, MacFarlane created a sequel to The Life of Larry called Larry & Steve, which featured the main character of his first film, the middle-aged Larry, and an intellectual dog named Steve. The short was broadcast as one of Cartoon Network's World Premiere Toons in 1997. Executives at Fox saw both Larry shorts and contracted MacFarlane to create a series based on the characters, to be called Family Guy. Peter Griffin, one of the main characters in Family Guy, was largely based on Larry. In addition, Steve would be the main inspiration behind the Griffin family dog, Brian. Fox proposed MacFarlane complete a 15-minute short, giving him a budget of $50,000. MacFarlane stated that the pilot for Family Guy took half a year to create and produce. Recalling the experience in an interview with The New York Times, MacFarlane stated, "I spent about six months with no sleep and no life, just drawing like crazy in my kitchen and doing this pilot." Upon completion of the pilot, the series went on the air. The network executives were impressed with the pilot and ordered thirteen episodes, seven of which aired during the first season of Family Guy. MacFarlane was offered a $2 million per-season contract. Title card for The Life of Larry. The Life of Larry is a 1995 animated film directed by Seth MacFarlane, who also stars as the majority of the characters. It also features a brief appearance from American politician Newt Gingrich in a cutaway gag that employs audio of one of Gingrich's speeches. The short features a middle-aged slob named Larry Cummings, his cynical talking dog, Steve, patient wife Lois, and overweight teenage son Milt. The film also features live-action segments shot at MacFarlane's home in Kent, Connecticut where he describes the film and its characters in the form of a pitch to a television network. During the live action segments, MacFarlane is being served cheesecake by his Asian servant, Wang, played by fellow student Chang S. Han. The Life of Larry was created as MacFarlane's thesis film during 1994–1995, while he was studying at the Rhode Island School of Design. The animated film was created almost entirely by MacFarlane alone, with the exception being the live action sequence, which was filmed by classmates Sean Leahy and Greg Scalzo. Many of the jokes and cutaway gags used in The Life of Larry were later used in many of the first season Family Guy episodes. Title card for Larry & Steve. Hanna-Barbera's head of development, Ellen Cockrill, saw The Life of Larry and met MacFarlane during a senior screening at RISD, and offered him a development position at What a Cartoon! to create a sequel of sorts to The Life of Larry, which Cartoon Network broadcast in 1997. He went on staff at the studio afterwards, developing a still-born revival of The Jetsons and becoming a staff writer on the Johnny Bravo series, partnered with writer/director Butch Hartman, under story editor Steve Marmel. The plot of Larry & Steve is that Larry adopts Steve from the dog pound, after noticing that he was the only talking dog (although to everybody else throughout the cartoon, Steve is just barking), and the two have a fast-paced, slapstick-filled day trying to buy furniture and appliances for Larry's apartment. There is also an airline pilot in this cartoon, whose voice and appearance is very similar to the Family Guy character Glenn Quagmire who is also a commercial airline pilot in Family Guy. Larry mentions a furniture store called "Stewie's", a name that will later be used for the character of Peter Griffin's infant son. The short was rated TV-Y7 for cartoonish slapstick violence, comic peril, and mild adult references. In basic form, The Life of Larry is very similar in format to Family Guy. Steve would be the main inspiration behind Brian. MacFarlane based Peter's voice, which was similar to Larry's, on the voice of a security guard he once overheard talking while he was attending the RISD. While Larry and Peter's wives share the same name, they do not resemble one another. Larry's son Milt, by contrast, harbors a basic design similarity to Peter's son Chris. The pilot of the plane that crashes in the store in Larry & Steve has a chin and voice that are both similar to Quagmire's, who is also a pilot. A bit character from both films, Shelley Boothbishop, made his way into the Family Guy episodes "There's Something About Paulie", "North by North Quahog" and "Long John Peter". ^ a b Lenburg, Jeff (2006). Who's who in animated cartoons: an international guide to film & television's award-winning and legendary animators (Illustrated ed.). New York: Applause Theatre & Cinema Books. p. 221. ISBN 978-1-55783-671-7. ^ a b "Seth MacFarlane - Profile". E! Online. Retrieved 2007-12-20. ^ a b "Family Guy Seth MacFarlane to speak at Class Day: Creator and executive producer of 'Family Guy' will headline undergraduate celebration". Harvard Gazette. Retrieved 2007-12-21. ^ a b c Strike, Joe (2007-02-13). "Cartoon Network Pilots Screened by ASIFA East at NYC's School of Visual Arts". Animation World Network. Retrieved 2009-10-18. ^ Andreeva, Nellie (2008-05-05). "Family Guy creator seals megadeal". The Hollywood Reporter. Retrieved 2008-05-31. ^ Weinraub, Bernard (2007-07-07). "The Young Guy Of 'Family Guy'; A 30-Year-Old's Cartoon Hit Makes An Unexpected Comeback". The New York Times. The New York Times Company. p. 2. Retrieved 2008-01-06. ^ MacFarlane, Seth (2006). "Inside Media at MTR (2006): Family Guy 2". Yahoo! Video. The Paley Center for Media. Retrieved 2009-10-18. ^ Dean, Josh (2008-10-13). "Seth MacFarlane's $2 Billion Family Guy Empire". Fast Company. Retrieved 2009-10-18. ^ Smith, Andy (April 30, 2005). "A Real Family Reunion". Providence Journal TV. Retrieved 2009-08-28. This page was last edited on 17 September 2018, at 18:43 (UTC).